And this one was publisher over two Gannett papers in New York. Monte Trammer (left) had run the Star-Gazette in Elmira — Gannett’s first newspaper — since 1999, and the Ithaca Journal since last year. Replacing Trammer: Sherman Bodner, who is the top executive of Gannett’s Central New York newspapers group. In addition to Elmira and Ithaca, the group includes the Press & Sun Bulletin in Binghamton. Central New York announced a big work consolidation in July. Raising the specter of layoffs, the Detroit Free Press and two sister operations fell well short of their target to reduce employment by 150, according to memos sent yesterday by senior executives. The buyouts, among the biggest by any Gannett business, originally came with a starkly worded warning about possible layoffs if there weren’t enough volunteers by the July 18 deadline — last Friday. Yesterday’s memos did not mention involuntary layoffs. Also, the memos reported conflicting totals on the number of volunteers, and did not give a complete breakdown of where the buyouts were falling by department. Human resources chief Kristi Bowden of the Detroit Media Partnership said 116 volunteers had offered to be voluntarily laid off. (The joint operating agreement partnership publishes the Freep and the formerly Gannett-owned Detroit News.) News Publisher Jon Wolman cited 115 volunteers. Both memos said all buyout applications had been accepted. There are plenty of other questions, too: “What are the terms of the buyout? What are they offering?” a reader asks in a new comment, below. I’ve e-mailed Bowden, asking if layoffs are now being planned. The News-Press in Fort Myers, Fla., laid off 36 and eliminated 10 unfilled jobs. Three Central New York papers cut about 10 jobs in a consolidation of ad sales and online operations. The Arizona Republic offered a second round of buyouts. The Honolulu Advertiser laid off 54. In Detroit, eligible staff were active, benefit-eligible employees who were at least 45 years old, with 10 years’ service as of Friday, July 18. Is your Gannett paper, TV station or other business cutting staff through buyouts or layoffs? Please post your replies — along with relevant memos — in the comments section, below. To e-mail confidentially, write gannettblog[at]gmail[dot-com]; see Tipsters Anonymous Policy in the green sidebar, upper right. Gannett’s cost cutting spread yesterday to central New York, where newspapers eliminated top management and other jobs in a reorganization of online operations and advertising sales. The papers are the Press & Sun-Bulletin in Binghamton, The Ithaca Journal, and founder Frank Gannett‘s first title — the Star-Gazette in Elmira. The Central New York Group’s shifts follow a second round of buyouts this week at The Arizona Republic, and layoffs at The Honolulu Advertiser, amid a steep plunge in Gannett’s second-quarter profits. His e-mail says one manager will now be in charge of the three papers’ online operations, and the number of online-only staff is being reduced, and based at Binghamton. Also, ad sales at the three papers will now be run by a single sales director, Bodner’s note says. Together, the three papers employ fewer than 800 workers. Job cuts at your GCI business? Please post a note in the comments section, below. To e-mail confidentially, write gannettblog[at]gmail[dot-com]; see Tipsters Anonymous Policy in the green sidebar, upper right. Datelines is an occasional roundup of news topping Gannett websites. McLean, Va.: More than three in four Americans think the country is in a recession, a USA Today/Gallup Poll over the weekend shows, reflecting a crisis of confidence that economists say could make the economy worse. Elmira, N.Y.: One day after taking the oath of office, New York Gov. David Paterson today is expected to further address his admission that he had an extra-marital affair. Indianapolis, Ind. : A piece of meteorite stolen from a museum was recovered after a man who owns another slice of the same rock saw it at a gun show. Tulare, Calif.: A lawn mower, two chain saws and a leaf blower were reported stolen to the Tulare County Sheriff’s Department. Elmira, N.Y.: The annual trout sampling on Catharine Creek is a shocker. Louisville, Ky.: Police found more than 200 used meth labs — the county’s largest-ever such discovery. Richmond, Ind. : The school board voted unanimously to prohibit students from wearing excessively baggy or tight clothes. 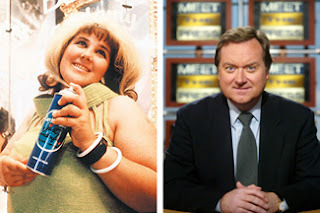 St. George, Utah: The state bar association is preparing free wills and other legal documents for police and firefighters.
. . . when Hairspray star Ricki Lake is pitted against journalist Tim Russert, standards change big-time! Ithaca Journal Publisher Monte Trammer says he’s seen some negative reaction in the year since the paper started letting readers leave anonymous online comments on stories through Gannett’s StoryChat feature. But Trammer, who also is publisher of the Star-Gazette in Elmira, N.Y., says readers treat StoryChat for what it is: unedited, unverified postings, mostly by anonymous users. “It’s nice to have standards, and we all do, but once we decide that we’re going to allow the public a voice, we have to allow the public its voice,” he tells the Journal. Got an offensive or just-plain-crazy comment that made it past your Gannett site’s filters? Use this link to e-mail Commentz Korner suggestions. See Tipsters Anonymous Policy in the sidebar, upper right. Or leave a note in the moderated comments section, below. You are currently browsing the archives for the Elmira category.